It's been a busy day today! As well as swimming this morning, my Mum came over to visit. It's been a beautiful day so we walked the kids to their promised trip to The Zone soft play, via one of their favourite playgrounds. They had a good long play on the way to The Zone, played while there were there, and then at the playground again on the way back! Not counting the actual playing they walked a good 3 miles. I was determined to wear them out! 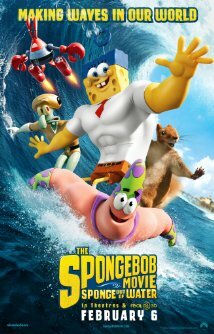 OK, so you probably have to be a SpongeBob fan (so sorry to you parents who aren't) and I have to admit that for me the film was just about long enough. And while the kids will want this on DVD when it comes out, I might find myself extremely busy with housework when they want it on. Once or twice will be enough for me. But Tom.... Well he LOVED it! It held his attention for the whole movie - which is good for a 4 year old. He laughed all the way through. He even forgot to eat all his sweets! And we BOTH joined in with the SpongeBob song at the end! So if you like SpongeBob it's worth watching. If you LOVE SpongeBob it's worth keeping. And if you don't but your kids do.... You have my full sympathy!